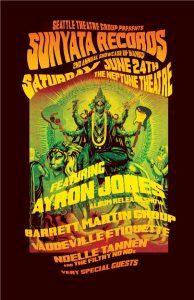 I feel honored to play with Barrett Martin (Screaming Trees, Walking Papers) at his record label Sunyata’s “2nd Annual Showcase Of Bands & Ayron Jones Album Release.” Tickets can be found on the Facebook Event Page. I hope as many friends and family can make it as possible. We will be touring and recording this fall as Barrett Martin Group. The group includes heavyweights Skerik, Andy Coe, and Evan Flory-Barnes.